Our Beloved Prophet [Sallal Laahu ‘Alaiehi Wa Sallam] gave the Azaan in his right ear and the Iqaamah in his left ear he then and made Dua for him. On the 7th day he was named Husaien and his Aqeeqah was performed. Rasoolul laah [Sallal Laahu ‘Alaiehi Wa Sallam],commanded Bibi Hazrat Faatimah Tuz Zahraa...[Radiyal Laahu 'Anha],to remove his hair and to give silver in charity equivalent to the weight of the hair. Imaam Husaien [Radiyal laahu’Anhu] was without doubt a very handsome personality. From his chest down to his blessed feet he was the image of Rasoolul laah[Sallal Laahu ‘Alaiehi Wa Sallam],whereas his elder brother Hazrat Imaam Hasan [Radiyal laahu-’Anhu] was the image of Rasoolul laah ,from his chest up to his blessed head. 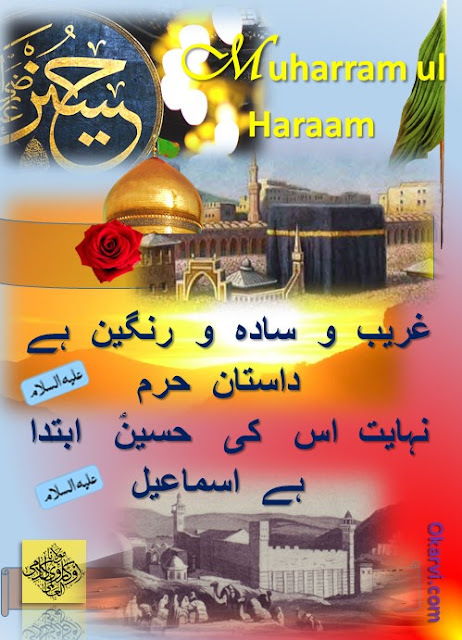 Hazrat Imaam Husaien [Radiyal laahu-’Anhu] was taught by Rasoolul laah and Hazrat Bibi Faatima [Radiyal laahu-’Anha] and Hazrat Alee[Radiyal laahu-’Anhu] Holy Prophet [Sallal Laahu ‘Alaiehi Wa Sallam],loved Hazrat Imaam Husaien due to his piety and pure heart. In every way he was superior and exalted in wisdom, action, piety, devotion and lineage. He knew the Laws of Islaam and the Tradition of the Prophet (Sunnat) very well. 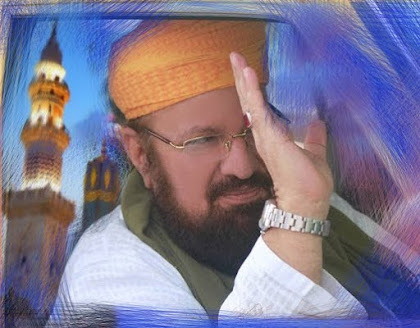 Hazrat Imaam Husaien [Radiyal laahu-’Anhu] was a very kind, gentle, generous, merciful and Allaah-fearing personality. He always cared for the poor and oppressed, assisted the helpless, gave comfort to those in pain and sorrow and showed great love and affection towards orphans. He was the embodiment of the character of his grandfather Saiyyidinaa Rasoolullaah [Sallal Laahu ‘Alaiehi Wa Sallam],and of his blessed parents. His tolerance and patience was also exemplary. This was manifested by the fact that his martyrdom had been foretold by the Beloved Rasool [Sallal Laahu ‘Alaiehi Wa Sallam],and even though he was aware of this, he still made Sabr and waited for the Will of Allaah [Subhaanuhu Wa Ta'aalaa].to take its course. 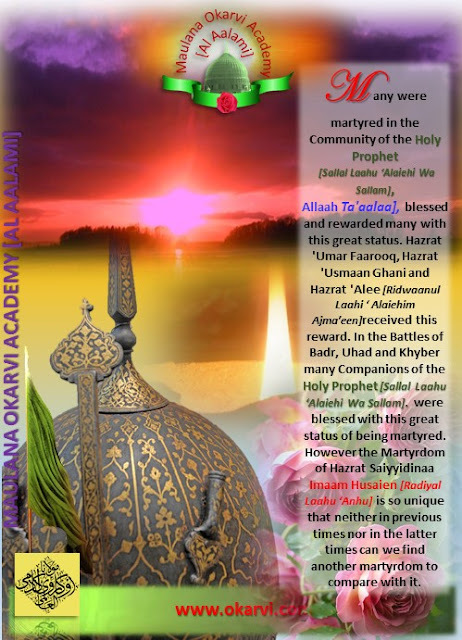 Hazrat Imaam Husaien [Radiyal laahu-’Anhu] was also blessed with bravery of the highest degree and this bravery and fearlessness was manifested on many occasions, particularly during the Battle of Karbalaa. "The Martyr experiences no more pain in being killed than one of you experiences from a sting." Some may object, that no pain is felt, since it defies human experience. How can it be that somebody is shot with a bullet or a spear; or pierced with a sword and yet feel no discomfort? I say that a declaration of the Holy Prophet [Sallal Laahu ‘Alaiehi Wa Sallam], [Peace be upon him, his family and his companions] can never be false. Let me explain it to you. He who gives his life in the path of Allaah Kareem must surely have great love in his heart for Allaah [Subhaanuhu Wa Ta'aalaa]. The love is the motivating force that makes one give one’s life in the path of Allaah Kareem. Only one drunk with the love of the beloved will give his life. The intoxication of love surpasses all other intoxications. Other intoxications wane, but the intoxication of love never decreases. The martyr at the moment of martyrdom sees heaven in front of him. One martyred in the way of Almighty Allaah, on the first shedding of blood, before the drops of blood reach the ground, he is shown his abode in paradise and He sees the radiations of Almighty Allaah’s Beauty unveiled. ﮐﺮ ﮔﯿﺎ، ﺩﻧﯿﺎ ﮐﻮ ﺍٓﺝ ﺗﮏ ﺑﺘﺎﯾﺎ ﮔﯿﺎ، ﻭﮦ ﺍﻧﺴﺎﻧﯽ ﺗﺎﺭﯾﺦ ﮐﺎ ﻋﻈﯿﻢ ﺟﺮﻧﯿﻞ، ﻓﺎﺗﺢ ﺍﻭﺭ ﺑﺎﺩﺷﺎﮦ ﺗﮭﺎ ﺍﻭﺭ ﺗﺎﺭﯾﺦ ﻧﮯ ﺍﺱ ﮐﮯ ﮐﺎﺭﻧﺎﻣﻮﮞ ﮐﯽ ﻭﺟﮧ ﺳﮯ ﺍﺳﮯ ﺍﻟﯿﮕﺰﯾﻨﮉﺭ ﺩﯼ ﮔﺮﯾﭧ ﮐﺎ ﻧﺎﻡ ﺩﯾﺎ ﺍﻭﺭ ﮨﻢ ﻧﮯ ﺍﺳﮯ ﺳﮑﻨﺪﺭ ﺍﻋﻈﻢ ﯾﻌﻨﯽ ﺑﺎﺩﺷﺎﮨﻮﮞ ﮐﺎ ﺑﺎﺩﺷﺎﮦ ﺑﻨﺎﺩﯾﺎ، ﻟﯿﮑﻦ ﺍٓﺝ ﺍﮐﯿﺴﻮﯾﮟ ﺻﺪﯼ ﻣﯿﮟ ﭘﻮﺭﯼ ﺩﻧﯿﺎ ﮐﮯ ﻣﻮﺭﺧﯿﻦ ﮐﮯ ﺳﺎﻣﻨﮯ ﯾﮧ ﺳﻮﺍﻝ ﺭﮐﮭﺘﺎ ﮨﻮﮞ ﮐﯿﺎ ﺣﻀﺮﺕ ﻋﻤﺮ ﻓﺎﺭﻭﻕ ﺭﺿﯽ ﺍﻟﻠﮧ ﻋﻨﮧ ﮐﮯ ﮨﻮﺗﮯ ﮨﻮﺋﮯ ﺍﻟﯿﮕﺰﯾﻨﮉﺭ ﮐﻮ ﺳﮑﻨﺪﺭﺍﻋﻈﻢ ﮐﮩﻼﻧﮯ ﮐﺎ ﺣﻖ ﺣﺎﺻﻞ ﮨﮯ؟ ﻣﯿﮟ ﺩﻧﯿﺎ ﺑﮭﺮ ﮐﮯ ﻣﻮﺭﺧﯿﻦ ﮐﻮ ﺳﮑﻨﺪﺭ ﺍﻋﻈﻢ ﺍﻭﺭ ﺣﻀﺮﺕ ﻋﻤﺮ ﻓﺎﺭﻭﻕ ﺭﺿﯽ ﺍﻟﻠﮧ ﻋﻨﮧ ﮐﯽ ﻓﺘﻮﺣﺎﺕ ﺍﻭﺭ ﮐﺎﺭﻧﺎﻣﻮﮞ ﮐﮯ ﻣﻮﺍﺯﻧﮯ ﮐﯽ ﺩﻋﻮﺕ ﺩﯾﺘﺎ ﮨﻮﮞ، ﺍٓﭖ ﺑﮭﯽ ﺳﻮچئے. ﺍﺱ ﮐﺎ ﺳﺎﺗﮫ ﭼﮭﻮﮌﺍ، ﺍﺱ ﮐﮯ ﺧﻼﻑ ﺑﻐﺎﻭﺗﯿﮟ ﺑﮭﯽ ﮨﻮﺋﯿﮟ ﺍﻭﺭ ﮨﻨﺪﻭﺳﺘﺎﻥ ﻣﯿﮟ ﺍﺱ ﮐﯽ ﻓﻮﺝ ﻧﮯ ﺍٓﮔﮯ ﺑﮍﮬﻨﮯ ﺳﮯ ﺍﻧﮑﺎﺭ ﺑﮭﯽ ﮐﺮﺩﯾﺎ، ﻟﯿﮑﻦ ﺣﻀﺮﺕ ﻋﻤﺮ ﻓﺎﺭﻭﻕ ﺭﺿﯽ ﺍﻟﻠﮧ ﻋﻨﮧ ﮐﮯ ﮐﺴﯽ ﺳﺎﺗﮭﯽ ﮐﻮ ﺍﻥ ﮐﮯ ﺣﮑﻢ ﺳﮯ ﺳﺮﺗﺎﺑﯽ ﮐﯽ ﺟﺮﺍٔﺕ ﻧﮧ ﮨﻮﺋﯽ. ✅ ﻣﺴﺠﺪﻭﮞ ﻣﯿﮟ ﺭﻭﺷﻨﯽ ﮐﺎ ﺑﻨﺪ ﻭ ﺑﺴﺖ ﮐﺮﺍﯾﺎ. ◾ ﺍٓﭖ ﻓﺮﻣﺎﺗﮯ ﺗﮭﮯ ﻇﺎﻟﻢ ﮐﻮ ﻣﻌﺎﻑ ﮐﺮﺩﯾﻨﺎ ﻣﻈﻠﻮﻣﻮﮞ ﭘﺮ ﻇﻠﻢ ﮨﮯ. ◾ ﺍٓﭖ ﮐﺎ ﯾﮧ ﻓﻘﺮﮦ ﺍٓﺝ ﺍﻧﺴﺎﻧﯽ ﺣﻘﻮﻕ ﮐﮯ ﭼﺎﺭﭨﺮ ﮐﯽ ﺣﯿﺜﯿﺖ ﺭﮐﮭﺘﺎ ﮨﮯ۔ "ﻣﺎﺋﯿﮟ ﺑﭽﻮﮞ ﮐﻮ ﺍٓﺯﺍﺩ ﭘﯿﺪﺍ ﮐﺮﺗﯽ ﮨﯿﮟ، ﺗﻢ ﻧﮯ ﺍﻧﮩﯿﮟ ﮐﺐ ﺳﮯ ﻏﻼﻡ ﺑﻨﺎﻟﯿﺎ۔"
جن کے بارے میں مستشرقین اعتراف کرتے ہیں کہ "اسلام میں اگر ایک عمر اور ہوتا تو آج دنیا میں صرف اسلام ہی دین ہوتا." We bid farewell to the old year by celebrating Prophet Ibraheem’s [Alaiehis Salaam] commitment to Allaah [Ta’aalaa] displayed through his willingness to sacrifice his beloved honorable son, Prophet Isma’eel [Alaiehis Salaam]; we welcome the new year by commemorating the martyrdom of Prophet Muhammad’s [Sallal Laahu Alaiehi Wa Sallam] beloved grandson, Hazrat Imaam Husaien. (O Allaah Kareem, Bless Prophet Muhammad [Sallal Laahu Alaiehi Wa Sallam] and the Aal [Family] as you blessed Hazrat Ibraheem [Alaiehis Salaam] and his Aal.Aameen.